Sorry, but the math doesn’t add up. If you put yourself in the shoes of the seller, would you sell a wheel for $300 that cost you $1500 just two years ago (or less)? Not unless there was something wrong with the wheel. Current top wheels cost $1500-2000. Half that and you’re left with mediocre models that have been in the market for at least a year. If you want a (used) wheel for $300, you have no margin to be picky about the model. Get the one that has the largest battery and most powerful motor you can find. And make sure it still charges up to at least 95%. And after a week or two you will realize that riding is so much more fun than you ever imagined, and you’ll be asking which $2000 wheel would be the best for you! I started with the Segway S1 which is as basic as possible. I bought it used off eBay for about $350 two years ago. After a lot of use, I've finally decided to upgrade this month, (waiting for my KingSong 18XL to arrive in the mail). However, I don't think if I would recommend that model now, 2 years later. The battery depreciates pretty quickly. Mine only goes about 5 miles in good weather, 3-4 miles on the cold winter days. I've not tried any other wheels, but I've heard reports that the Segways S1 is actually more difficult to ride than other similar models, but I cannot confirm that. I should have perhaps clarified my view better. Sure, one can have fun riding a slow wheel for very short distances. I did that too at first. But it’s a different hobby and different feeling than to go fast with a big, able big battery wheel that you can push hard even off road if you so wish. And even replace your car with. One can learn to ride with pretty much any wheel (that’s what they were designed for after all), but to be able to decide wether you’d like what the current wheels can offer, you need a wheel that is even remotely in the same ballpark. The capabilities of an EUC has taken huge leaps in the last 2-3 years. I started 4 months ago with Ninebot E+ I got on Ebay. I think it's good one to start with. It cost me less then $300 on ebay and they seem always have refurbished ones to sell.About two months ago . I bought an Mten3 because I wanted something easier to keep in my car. It's a lot easier to ride once you're on it, but it can be "tricky" to mount. I think the Mten3 would be a lot easier to learn to ride/control for a beginner once you learn to jump on it and go. I've had great fun learning on a S2 (14", closest competitor to the v5f) if your not too heavy its a nice wheel. Probably the in motion also, better equipped but a bit more twitchy due to slimmer tyre and higher pedals. I've done close to 1000km on it with a range of 20+km. The v5f regularly have very good gear best promos, while the S2 can be found second hand close to same price. Both are good enough for fun or city use, so getting a beefier wheel later on won’t invalidate them IMO. Once I got the hang of it I was better able to figure out where I what I wanted in a new wheel. You can't go wrong with the V5F, I think everyone should have one in their arsenal. The zippyness and agility bring a smile to my face every ride. The natural evolution from a V5F is to get a serious commuter/cruising wheel with more range, comfort, and speed. You sacrifice agility and torque with bigger better wheels but it's worth it. For me I'm going from a V5F and Ninebot One E+ to a King Song 16S and that's about all I will need where I live (actually I think I've changed my mind to GW Tesla once they are in stock). The NB1e+ was a redundant purchase but I was really curious to compare, I'll be teaching friends on that wheel or probably selling it (I don't recommend a NB1 at all over a V5F). Edited April 15 by Altaire. If you want to go anywhere crowded, or go into a store, or pick up some food , etc you have to go with the V5F instead lugging a 31.5 pound deadweight around by a weird fold out handle. The lesser weight, the kill switch handle, the trolley, the maneuverability, griptaped pedals, the headlight, visible battery indicator, brake lights that aren't hidden on the side like the NB1.....the responsive safe programming and sensors. The NB1e+ is ancient and it feels unsafe at it's higher speeds. It's more comfortable on longer rides since it has a bigger wheel,, but you better pray on bumpy surfaces your shoes don't slip off the very minimal rubber on the pedals. If it's wet outside, forget about having a good grip on the pedals. Yes the NB1 E+ can be interesting when really cheap (happens), but otherwise the V5F is better equipped and more modern. Only benefit of the E+ is larger tyre in case your ground is very chunky. $550 is an incredible price IMO; you get free extras like the trolley handle, mudflap, awesome reflective tough cover, and wristguards. I don't know of any coupons. Agreed! Better to go with somebody dependable that supports the EUC community. Service and shipping speed has always been great with ewheels. Many have purchased from other vendors with very mixed success. Honestly dealing with Jason at ewheels is worth the few dollars you might have saved elsewhere. I purchased my V10F from him and he couldn't have been more patient and helpful. Just my 2 cents. Suggest you give him a call and see if there's anything he can do - maybe he has a refurbished V5F he could sell you? 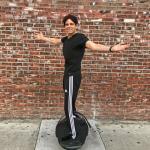 IF you do want a Ninebot E+ on ebay cheap, you're going to have to bid until you get one for the price you want. I do like the big tire because the roads are rough where I live. The NB1E+ is still a best choice if you can find one new for $350 or less, or $250 or less used. Don't pay more than that. Otherwise, take the risk and spend the money on a new model from ewheels.com. Unless you get hurt (from lack of safety gear), chances are you will want to keep riding forever. I also think you will lose less money if you resell a higher end wheel than paying too much for an older model.